It made news at CES 2017, first as the prototype 3-monitor laptop, then as the demo that got taken at the show. Razer is offering a $25,000 reward for information that will capture the culprit. In the meantime, the laptop is still continuing it’s move forward. By adding the Thunderbolt 3 USB-C port, you can add another dual 4K monitor setup to your home use. This gives you five 4K monitors to game with, or run any other apps you need. Of course, with the Thunderbolt 3 port, you can also connect external keyboards, mice, and other devices if you need them. 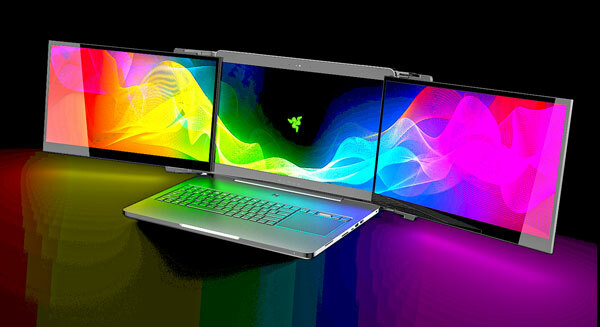 Since this is a concept, we might not see this version of the laptop anytime soon on shelves. But Product Manager Vincent Chen says the response for this type of laptop is really good and we could see something similar in the coming years.